Microphlebectomy is a minimally invasive surgical technique used to eliminate unsightly or painful leg veins. This is the recommended treatment for large surface varicose veins. Due to their size, these veins cannot be effectively treated with sclerotherapy. Removal of the veins with microphlebectomy results in quicker healing, less pain, and a better cosmetic result than would occur without this treatment. 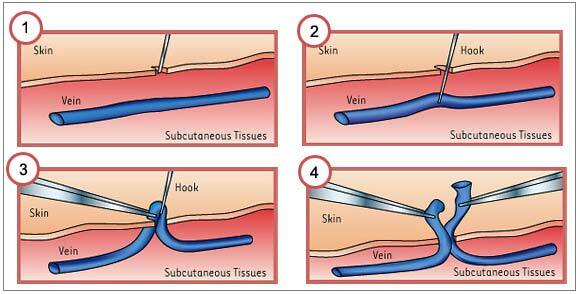 This technique should not be confused with surgical vein stripping as it differs dramatically from that procedure. The treatment generally takes one hour to perform with the surgeon carefully removing the vein from the leg, thereby eliminating the unsightly and often painful varicosity. There is no negative effect on the blood flow or circulation in the leg. The blood that has been carried by that vein is simply rerouted to another vein deeper in the leg. Circulation and blood flow continue as before, but better and more efficiently. Recovery is more rapid, and a majority of patients do not need to interrupt regular activity after microphlebectomy. In many cases, compression sclerotherapy is still the treatment of choice, this technique can be a valuable tool for treatment of some patients. A physician will discuss with you the most appropriate treatment options in your particular case. If you have varicose veins, you may be a candidate microphlebectomy. To find out whether you might benefit from microphlebectomy, call our office to schedule a consultation with Dr. Himmelberg to assess your treatment options. When is the microphlebectomy procedure offered? Microphlebectomy is performed for the treatment of large dilated surface varicose veins. To prevent recurrence of these veins, microphlebectomy is usually combined with or preceded by endovenous laser treatment or radiofrequency ablation of the greater or lesser saphenous vein(s). This procedure is performed in a comfortable outpatient setting using only local anesthetic. The vein(s) to be removed are outlined, and the leg is washed and prepared for treatment. Abnormal or diseased veins are accessed and removed through a series of pinhole perforations using a special set of instruments. Because microphlebectomy is performed through small needle punctures, it is far less invasive than vein stripping, which is performed through incisions. Following the procedure, the small punctures are closed with Steri-Strip bandages, and a compression wrap is applied to the treated leg. You will be asked to walk for at least 20 minutes immediately following your treatment. A prescription-strength compression stocking will need to be worn for about two weeks following the procedure to achieve maximum healing and results, and avoiding exercise for the same period is encouraged. Most patients do not need to interrupt other regular activity after microphlebectomy. Many insurance carriers (including Medicare) do provide coverage for microphlebectomy. Unfortunately, not everyone is a candidate for coverage. Carriers will cover the procedure only when deemed medically necessary. Patients must demonstrate symptomatic venous reflux disease to be considered for coverage. Symptoms associated with venous reflux disease are: pain, swelling, leg cramps, ulcers, bleeding from varicosities, etc. Patients are also required to try conservative treatment before being considered for coverage. Insurance companies will also want to see ultrasound results to determine the presence of reflux in the diseased vein(s). You may find it helpful to contact your insurance company if you have further questions about coverage.